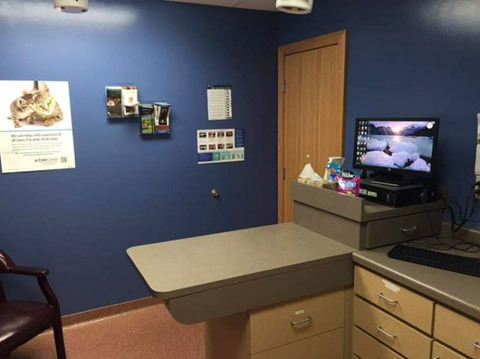 Capital City Veterinary Clinic is a full service veterinary Hospital offering routine and urgent care services for your pet. We are open 7 days a week with convenient late evening and weekend hours. 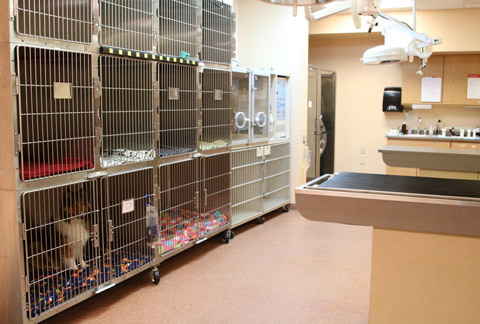 Our clinic is fully walk-in for routine as well as urgent care needs of your pet. 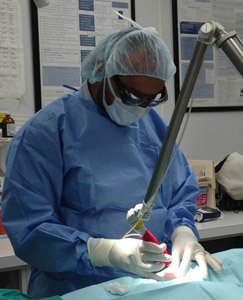 We only make appointments for routine surgical and dental procedures. 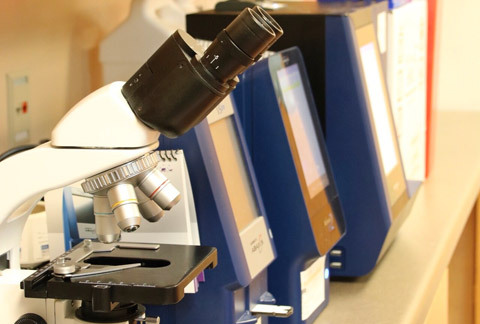 We are fully equipped with in house lab, capable of performing full blood panels in cases of emergency, digital radiography, laser (to minimize bleeding and pain),ultrasound, full pharmacy and prescription diets. Our clinic also offers wellness and preventive care packages for pets of any age along with additional discounts on other services. 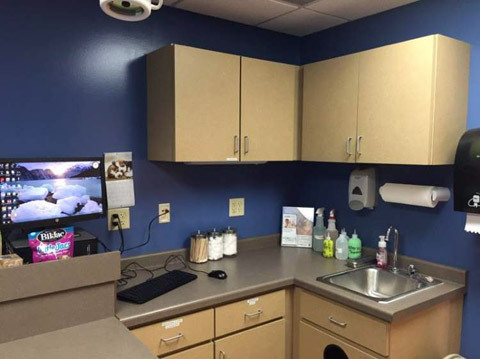 Capital City Veterinary Clinic is dedicated to providing pets and clients the highest quality and most compassionate care at a reasonable cost. Dr. Dean’s special interests in practice are nutrition, animal behavior, ophthalmology and urology. 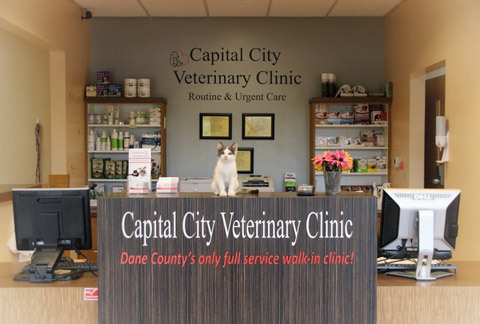 Prior to coming to Capital City Vet Clinic, he did veterinary clinical research in the University of Minnesota’s departments of Integrative Biology and Physiology and Veterinary Clinical Sciences. When not at work, his hobbies include travel, home improvement projects, rugby union, camping and fishing. He and his husband live on the north side of Madison with their sheltie/corgi mix, Molly. 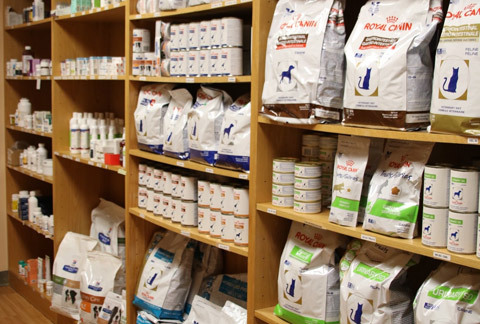 Dr. John Carey has been practicing veterinary medicine since 1999. 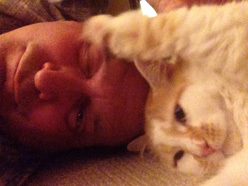 His interests are orthopedics, feline medicine, and helping older cats and dogs live longer healthier lives. Outside of work he enjoys camping and hiking with his family and he also plays in several local jazz groups. From growing up in the Milwaukee area to currently living in Madison, Pheadra grew up around pets her whole life. She has always had a passion for helping and taking care of animals from large to small. 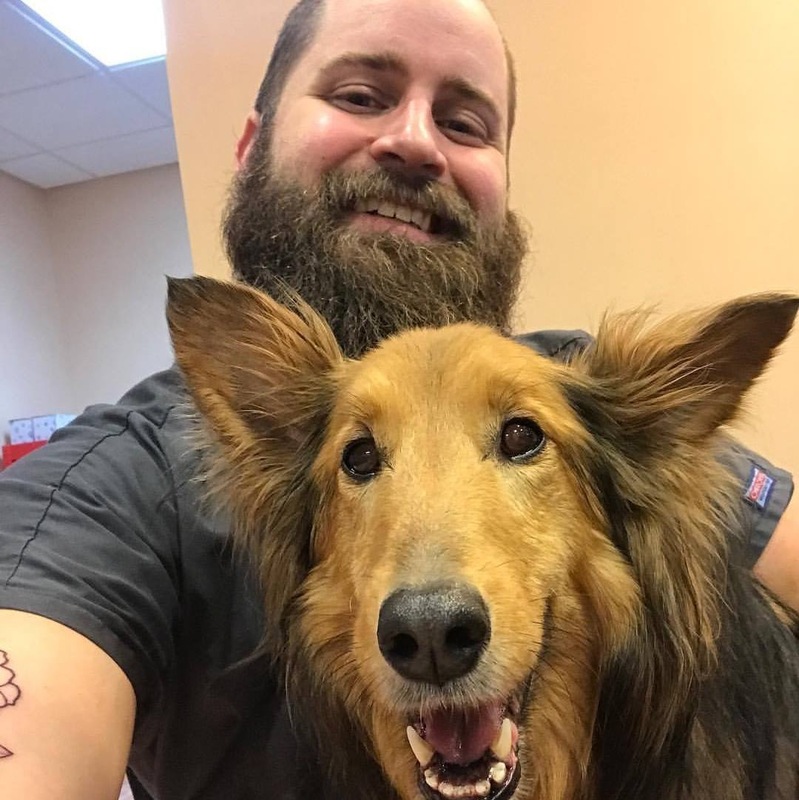 Before joining our team at Capital City Veterinary Clinic in the fall of 2016, Pheadra worked in the veterinarian field for 4years, both in emergency and day practices. 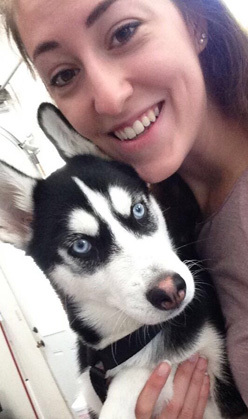 When Pheadra’s not at work, she spends her free time with family, friends and her Siberian husky Koda. On her leisure time she likes being outdoors enjoying her favorite hobby with her three horses Charlie, Ollie, and Cookie horseback riding. Leah joined the Capital City Vet Clinic family in 2017. She grew up with various family pets in Milwaukee, WI. 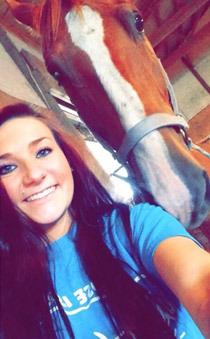 Outside of work, Leah enjoys pleasure riding her horse Ollie, playing with her dogs Maddie and Bootsie, and spending time with her daughter Brylee. Leah enjoys being around all types of animals large and small. Her favorite part of veterinary medicine is seeing pearly white teeth after cleaning years of tarter build up from dental patient’s mouth. Nicole has been a member of the St. Paul Team since April 2016. She is currently a 2nd year student at UW- School of Veterinary Medicine. She loves her job at St. Paul Vet Clinic and at Capital City Vet Clinic! Per Nicole she has the the best coworkers and there’s never a day where she doesn’t learn something new. 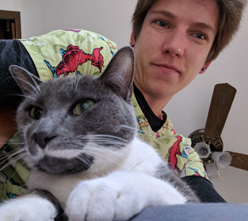 When she is not playing with puppies and kittens at the clinic (or studying) you’ll find her either rock climbing, playing guitar, video gaming, or enjoying the companionship of her own three cats Fred, Tessa, and Octavius. Abby has spent a lot of time volunteering with animals and working at doggy daycares before finally finding her home here at Capital City Vet Clinic. Her favorite volunteer experience was at Four Lakes Wildlife Center where she helped rehabilitate wounded wildlife such as song birds and turtles. She also really enjoyed caring for horses at Three Gaits, a therapeutic horsemanship organization that helps kids with disabilities enhance their physical and mental abilities. She was the vice president of her high school’s FFA club and is very active in her community. Straight out of high school, Abby joined the Air Force to help pay for college. 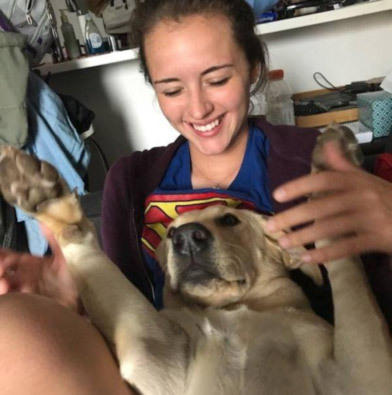 She is currently serving in the Air National Guard as an F-16 mechanic, working at Capital City, and earning her bachelor’s in Animal Science before applying to vet school herself. She has one silly yellow Lab named Gilly and a cat named Sabbath! Hannah has been working as a vet assistant for the past 11 years and has just joined the Capital City Team this year. 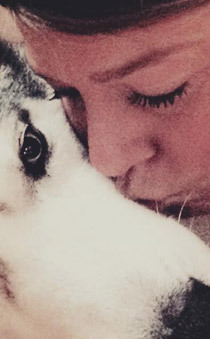 She has been around animals her entire life and has always had a passion to work with them. She has a 10 year old daughter names Gabriella and a 3 year Terrier Mix named Gunner. In her free time she likes to spend time with family, cook and travel. Miranda is currently in her senior year at UW Madison getting ready to graduate with a B.S. of Animal Science in May and a certificate in French. 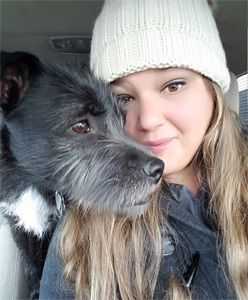 She has worked in several areas of veterinary medicine including pathology, large animal care, and overnight care. With hopes of attending vet school next year, she is extremely passionate about animal health and excited to be part of the Capital City team. A unique fact about her is that she spent a year abroad in France and still loves watching French films as well as cooking French cuisine. When she isn’t caring for animals at Capital City, she spends her time trying out new recipes, hanging out with family, or cuddling with her two cats, Roger and Nemo. Sarah was born and raised in Green Bay, WI. Naturally, she is a Packers fan. After high school, she attended UW-River Falls where she pursued a degree in Animal Science: Companion Animals and a minor in Biology. During her four years there, she played three years of college soccer supporting the Falcon colors. 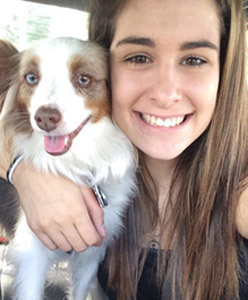 After graduation, she adopted her best friend, Dazzle, a toy Australian Shepherd. She then attended Madison College to further pursue her dream of becoming a Certified Veterinary Technician. She enjoys going on adventures to Wisconsin State Parks and doing anything outdoors.